It’s warm again, and do you know what that means for me while my family goes on vacation? A kennel. I watched as my mom took care of the suite reservation online…it all happened so fast. The internet confirmation was immediate and this place “Big Times Kennel” even confirmed my fate by phone. At least my mom seemed happy and she was impressed by how easy it was. The bags are packed and the morning has come for my family to drop me off. The owners, Maureen and John, meet me and my family at the door. They’re very nice to me, leading me to my suite and making me feel very special. I look around and immediately see a copper water bowl, and it never empties! It’s like magic! While I’ve been here, the incredible level of care has allowed me to adjust leaving home seamlessly. 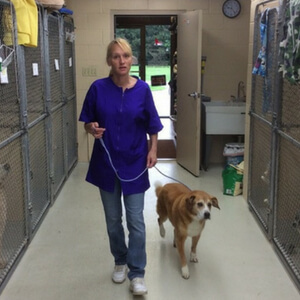 At 7:00 a.m. the kennel comes alive as Tina arrives, followed shortly by John and Maureen. 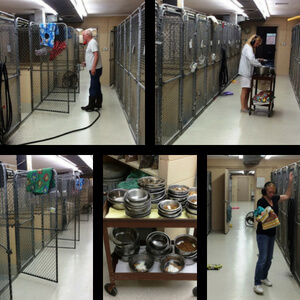 As we run outside, the kennel doors are closed behind us and all suites are cleaned and sanitized by John while Maureen prepares breakfast. Tina follows by wet and dry mopping so when we go back inside, breakfast is served. While we eat, John is busy cleaning and sanitizing the outside area. Afterward, we are given free access to the outside until 11:30 a.m. when we are called inside for treats as Maureen makes sure we are all doing well. In a short time, the doors open and I notice that once again my area is fresh and clean. Things begin to quiet down around noon when the kennel closes until 3 p.m. This is the perfect time to take a nap either outside in the sun or inside on a soft fleece blanket where it is cool. At 3 p.m. Maureen and John are back to check on everyone and clean up inside and out. I hear the clatter of dishes around 4 p.m. and my keen sense of smell detects my favorite food Mom packed for me to enjoy. Afterward, my friends and I get some more outside time before bed. 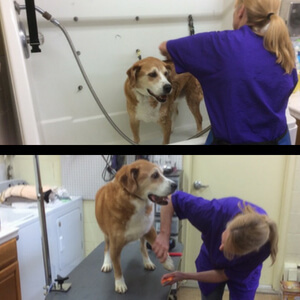 My last day came much faster than I ever would have thought, and by 11:30 a.m. I’m already getting special treatment in something called the “the grooming room.” I get the full spa treatment including brush out, bath, blow out, haircut, and even a nail trim. I’m practically sparkling! My breakfast is waiting when I get out of the salon and after that, I have just enough time to nap in the sun before my family is at the kennel door. After a quick goodbye to my new friends Maureen, John, and Tina I’m ready to go home after my Big Times vacation. Big Times is not a bad place. You can go outside if you want or stay in at your own leisure. You take a potty break on your schedule, not the caretakers. You are given a lot of time to do what you want (inside or out). You get lots of attention from all the people, and they even know your name! You never worry about the weather since the outside is covered, and the place is heated and air-conditioned 24/7. Hopefully, I will be coming back soon! You’re not the only ones going on vacation this summer, so reserve your spot for your pooch or kitty now while they’re still available! Call us today 937-885-3427 or apply online to reserve your suite. For detailed information about dog and cat boarding accommodations and amenities, visit our website at bigtimeskennel.com.